The Real Cider web site is not just a news and information web site. It’s always been a community web site, featuring your thoughts, feedback and stories. So why not get involved? If you enjoy the Real Cider web site and want to take part there are a few ways you can do so. 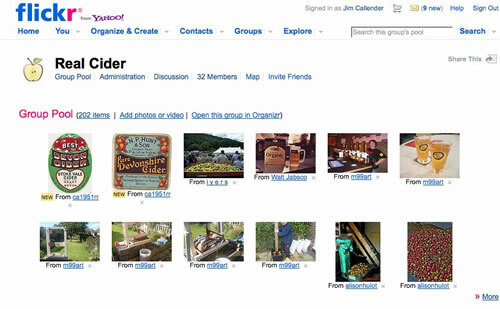 As I have already said the Real Cider web site is the community’s web site. If you have a great idea for a blog post we would love to hear it. Write it for your own blog, send us the link and we will republish it. We are hoping that our most popular blog posts will be by guest authors. 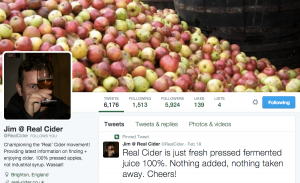 @realcider – This is our twitter account. I tend to talk about a what’s happening on the site, other interesting sites, and chat with other cider fans on twitter. Like all good online communities we have a Facebook group. There are some active members on this group and we get a lot of new members through this group. This is where you can add any photos you have taken that are about apples, or cider. There’s some great ones already in the group pool. 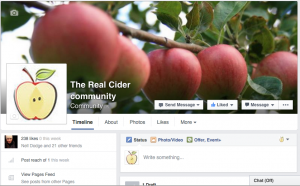 These photos magically appear in the Real Cider Gallery when you add your photos to this group. Obviously this list does not include everything, as we are still expanding the site. However, hopefully it shows we are keen to include the community in anyway we can. If you have other ideas of how we could include people please let us know using the contact form. Jim Callender, Founder of the Real Cider community.